I hope this email finds everyone and their families happy and healthy. With warmer weather upon us and the vineyard in full swing I would like to use this opportunity to update you on some exciting developments at Raffaldini. Firstly, some of you may have already noticed two new street signs have appeared, one on the newly paved Groce Road, half way up before the turn into Raffaldini and the other immediately after the stone entrance gates. These are signs to alert visitors that this is Black Rooster Territory. Black Rooster translates from the Italian as Gallo Nero and is used to mark the boundaries of the Chianti region in Tuscany and the Black Rooster appears on all wines designated as Chianti Classico. As we produce Sangiovese (the grape used to make Chianti), and we are frequently referred to as Chianti in the Carolinas, I thought it fitting that we designate our own area. Not many people know the story behind the Black Rooster. As legend has it for centuries the ruling families of Florence and Siena were at war and one day the patriarchs agreed it was time to end the fighting and permanently agree to a boundary line. Their method chosen was classically Tuscan – at first rooster crow in the morning each family would send off their fastest horse from their city center (frequently a church) and wherever the riders met on the road between the cities would be the boundary. The ruling Florentine family had a Black Rooster who they starved and kept in a dark box for days while the Sienese had a White Rooster and was endlessly pampered and lazy. On the day of the race the Black Rooster sang much sooner than usual given his extreme hunger and this gave the Florentine rider a huge head start. As the border is much closer to Siena (meaning more land for the Florentines) the Black Rooster is a centuries old source of irritation for one family and joy for the other. Happily for both, the area around the border happens to be Chianti which is home to the greatest Sangiovese wine made in the world. Such is the wonderful nature of life in Italy. I am also pleased to announce the arrival of our eight new large custom made oval and round oak bottis (each the equivalent of eleven standard oak barrels), all handmade by the famous Gamba Cooperage in Asti, Italy. They join the three existing bottis we purchased last year. These bottis will last for half a century and add a beautiful structural element to our red wines. In addition we are furthering our commitment to fermenting in oak (rather than stainless steel) and have received another four oak fermenters from Gamba to complement the two onsite now. I simply love oak fermented wines, for their depth and complexity are second to none. This year we will even ferment our Vermentino in oak for the first time. I believe this very significant investment in large oak vessels will allow Raffaldini to push the quality envelop even further in our attempt to make the best wines we possibly can. We would appreciate it if you would take a moment to review us at one or more of the following sites. Your review will help us build our reputation as we continue to spread the word about Raffaldini to others. The Party 4 Paws is AARF’s largest annual fundraiser. It is dedicated solely to underwriting the substantial medical expenses incurred in helping the ill and injured cats and dogs that AARF rescues. Funds raised from the event will ensure that AARF can continue to be a major rescue service in Forsyth County that treats any and all health situations, including vaccinations, spay and neuter, treatment of disease, repair of broken limbs, providing emergency services and surgery when needed. It's an Easter-Egg-Stravaganza! Easter Brunch, Egg Hunt, Baby Goats, Cheese Roll, and Much more! Bring the whole family and feast together over an Italian-style buffet brunch along with award winning Raffaldini wines. An Easter egg hunt for the kids will take place on the lawn following brunch at 2:30pm, and we will have Heritage Homesteads baby goats out again this year for petting. La Ruzzola Del Formaggio, a traditional Italian game of the rolling of the cheese! La Ruzzola dates back 3000 years to the Etruscan Tomb of the Olympiads but is now played with each Easter in select Italian villages. The cheese rolling competitions will be held at 1pm and 3pm on the lawn. Easter Brunch tickets are $50 plus tax per person and include two glasses of Raffaldini wines. Easter Brunch tickets for nondrinkers and those under 21 are $25 plus tax per person. Cheese Roll, Goat Petting, and Egg Hunt are free. Enjoy a traditional Italian-style afternoon of food and wine as we grill salsicce (sausages), drink wine at the winery. This event is hosted by Owner Jay Raffaldini and is sure to be a relaxed and enjoyable Saturday afternoon. Ticket price is $50 plus tax per person and includes admission to event, grilled traditional Italian sausage lunch, with grilled peppers and onions and assorted sides such as Italian pasta salad, Italian potato salad, green salad, tiramisu, and Raffaldini wines. Enjoy this opportunity to join owner Jay Raffaldini in an exclusive salon wine tasting. Held in the barrel room of the winery, guests will enjoy a blind tasting of four Sangiovese wines, one from Raffaldini Vineyards and three others from highly rated vineyards throughout the world. This intimate, wine-focused event is limited to 48 guests. Anti-pasti will be provided by Bottles & Boards. This event is for those ages 21 and up. We are pleased to present Raffaldini wines along with our distinguished #NCWine peers at Piedmont Culinary Guild's Sensoria hosted by Central Piedmont Community College. Indulge your senses and taste local wines accompanied by cuisine from the region's top chefs and farmers. Engage in unique flavor experiences taught by the experts and learn alongside your favorite producers. This is the ultimate foodie event! Click to learn more or purchase tickets. If you are attending the Spring Four Seasons Dinner on Saturday, April 13, make it a weekend! Easter Brunch tickets are $50 plus tax per person and include two glasses of Raffaldini wines. Easter Brunch tickets for those under 21 are $25 plus tax per person. Cheese Roll, Goat Petting, and Egg Hunt are free. We are pleased to offer a limited number of used wine barrels from Raffaldini Vineyards for sale. Barrels are priced at $125 and are perfect addition to your home or carve them up for your custom crafts to accent your house bar! Please contact us to arrange for sale and pickup. Jesse serves as the Event Director at Raffaldini Vineyards. After graduating from Appalachian State University, her passion for creative cuisine and fine wine led her to Asheville, NC where she extended her studies into culinary technology, wine appreciation and facilities management. Jesse has been apart of the Raffaldini team since March 2013. She started out working part time in the tasting room and now can combine all her passions as she creates, plans and promotes the vineyards unique on-site events, from wine dinners, weddings and festivals to private wine tastings and luncheons. In her time off, Jesse loves spending time with her husband and children, tending the family garden, creating meals and memories in the kitchen, which always goes better with a glass of wine. Contact Jesse to schedule your event today! Donizetti’s bel canto comedy, The Elixir of Love is as charming as it is funny. Nemorino, is a likeable but hopeless romantic who has fallen in love with the bold and quick-witted Adina. She isn’t won over by his pleas of love and things get worse when she has an offer of marriage from the self-important Sergeant Belcore. When a dubious salesman, Dulcamara, rolls into town he offers Nemorino what seems like the perfect solution. a/perture cinema opened with the purpose of showcasing independent, foreign, documentary, local and festival films. a/perture is a destination for non-commercial and artistic films that were not offered elsewhere in Winston-Salem and the surrounding communities. Located in the heart of downtown Winston-Salem, a/perture revived the theatrical experience in the central business district. a/perture provides the community a home for more than 4,000 film screenings and events per year. You’re invited to join Owner Jay Raffaldini in the barrel room of the winery as he reveals our 2017 Grande Riserva! Grande Riserva, as the name implies, is a wine that represents the utmost and very best efforts of all that we do from the vineyard to the winery. The event will consist of a Blind Tasting of the 2017 Grande Riserva and three other highly ranked wines along with heavy Hors D'oeuvres from Chef Corey Hooks. See for yourself how Raffaldini Wine compares to some of the top rated wines in the world. Join us for the unveiling of four, brand new wine club releases! Wine club members will receive a complimentary food and wine tasting featuring a recipe and wine pairing from our Spring 2019 wine club package. 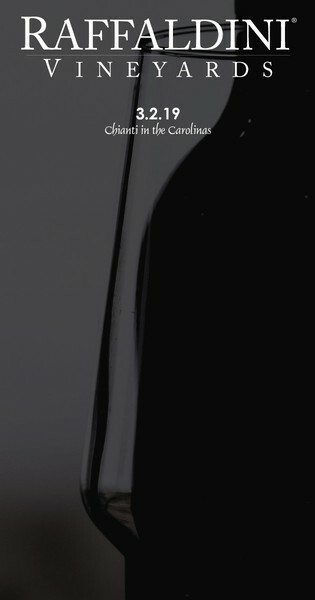 This new release will also feature an exciting new wine tasting glass and a brand new bottle packaging design. On Saturday, mingle with Owner and Winemaker Jay Raffaldini and learn about the new wines and happenings at Raffaldini Vineyards with intimate conversations with Jay at 1pm and 3pm. The Party 4 Paws is dedicated solely to underwriting the substantial medical expenses incurred in helping the ill and injured cats and dogs that AARF rescues. Funds raised from the event will ensure that AARF can continue to be a major rescue service in Forsyth County that treats any and all health situations, and surgery when needed. The Party 4 Paws will be held May 18. Click the logo to learn more. Raffaldini Vineyards was honored to contribute to the Next Step Ministries Unmask the Violence event last month. Next Step Ministries provides support for women and children victims of domestic violence in the Forsyth County area. If you are in need of help, please call our crisis line at 336.413.5858. Click the logo to learn more or contribute. 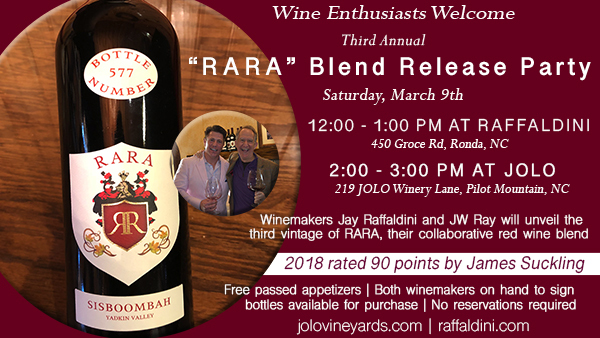 On Saturday, March 9, 2019, JOLO Winery & Vineyards and Raffaldini Vineyards will once again host back-to-back special release events for their third annual wine blend collaboration, RARA Sisboombah. Jay Raffaldini and JW Ray will co-host two events on Saturday, March 9th, where they will share their winemaking stories over complimentary passed appetizers. The first event will take place at Raffaldini Vineyards beginning at noon, and the second will begin at approximately 2:00 p.m. at JOLO Winery & Vineyards. Both events are open to the public and no reservations are required. 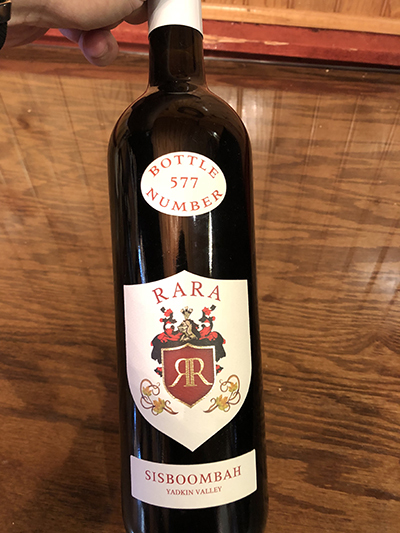 A very limited number of bottles of RARA will be available for sale at JOLO Winery & Vineyards and Raffaldini Vineyards while supplies last. The price of a bottle of RARA is $45. Last year's vintage received a 90 point score from world famous wine critic, James Suckling! Join Chef & Culinary Instructor, Corey Hooks, as he demonstrates two signature recipes. Learn professional techniques and have your culinary questions answered. Guests will sample all dishes and enjoy Raffaldini wine. Recipe cards for each dish will be provided. Donizetti’s bel canto comedy, The Elixir of Love is as charming as it is funny. Nemorino is a likeable but hopeless romantic who has fallen in love with the bold and quick-witted Adina. She isn’t won over by his pleas of love and things get worse when she has an offer of marriage from the self-important Sergeant Belcore. When a dubious salesman, Dulcamara, rolls into town he offers Nemorino what seems like the perfect solution. Join us for the unveiling of four, brand new wine club releases! Wine club members can enjoy a complimentary food and wine tasting featuring a recipe and wine pairing from our Spring 2019 wine club package. Jay Raffaldini and JW Ray will co-host two gatherings on Saturday, March 9th, where they will share their winemaking stories over complimentary passed appetizers. The first event will take place at Raffaldini Vineyards beginning at noon The second gathering will begin at approximately 2:00 p.m. at JOLO Winery & Vineyards. Both events are open to the public and no reservation is required. A very limited number of bottles will be available for sale at JOLO and Raffaldini Vineyards while supplies last. Bottles are priced at $45. Last year's vintage received a 90 point score from world famous wine critic, James Suckling! Join Chef & Culinary Instructor, Corey Hooks, as he demonstrates two signature recipes. Learn professional techniques and have all of your culinary questions answered. Enjoy sampling the dishes along with Raffaldini wine and take home recipe cards. Raffaldini Vineyards wishes to congratulate our friend Irene King on her nomination into the Business NC Legal Elite awards. Irene also is a trained opera singer and has graced us with our voice on many occasions. We are pleased to provide wine for the occasion and toast Irene. Auguri! The NC Fine Wines Competition is the toughest state-specific competition in the country, and you can be side by side with the owners and winemakers from across the state when the coveted NC Fine Wines Case awards are announced! This is your chance to attend the awards ceremony and enjoy an exquisite dinner paired with NC Fine Wines.There is a limited allocation of seating open to the public. Click here for tickets and menu. Cotton joined Raffaldini Vineyards in August 2017 as the Cellar Master. In his role, Cotton oversees the day to day operations of the winery. Prior to Raffaldini, Cotton had a forty seven year career as a Nuclear Engineer. Raffaldini is thrilled to have Cotton's expertise and enthusiasm at the winery and in the villa on a daily basis. Last year's offering earned a 90-point rating by James Suckling. "We have had so much fun with this collaboration, says Raffaldini. "Fans of both wineries really seem to enjoy the two wines we have produced together." Ray adds, "Last year's RARA sold out in less than three days. With the growing interest in our collaboration, we fully expect a similar (if not quicker) depletion of the inventory of this full-bodied, well-balanced red wine blend. It's one for the ages!" Copyright ©2019 JOLO Winery & Vineyards, All rights reserved. You are receiving this email per your sign up request on our Facebook fan page.